It's a busy couple of weeks with summer camps here in Victoria, but have found some free time today to write a new post. Today I'm going to talk about the tin. 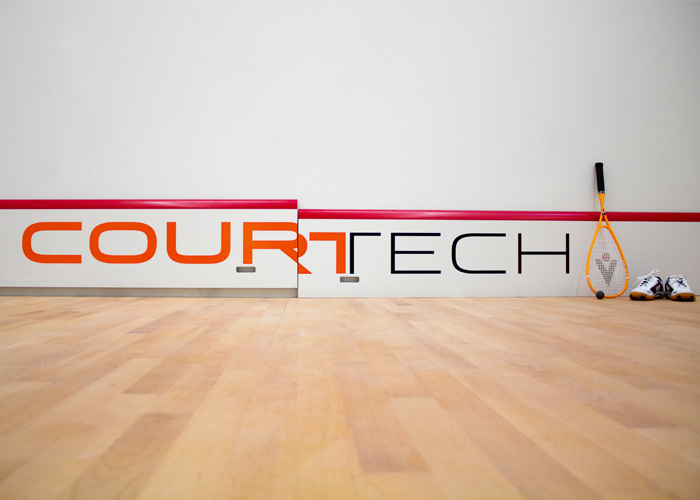 The height of the tin on a standard court is 19 inches or 48 centimetres. The men on the pro tour have played with a lower tin at 17 inches or 43 centimetres for a number of years now. They made this change to make the game more exciting and to reward attacking play. Clearly a more attacking game makes squash more exciting to watch. I've heard that lowering the tin by 2" makes the court play a few feet longer. The drops come up shorter and the court plays longer. If you've played on a lower tin you'll know how much of a difference tin height makes. I find most amateurs don't understand the concept of the height of the ball and where their target should be. I find the visual of thinking of the tin as a net is useful in this approach. We can then compare the tin to a net in badminton or volleyball. When the ball is below the net in badminton or volleyball you cannot smash the ball and have to lift the ball to get it over the net. Whereas the higher (within reach and ability) the ball is the more serenely you can attack at a severe angle and spike the ball or shuttlecock. Even without knowing much about these other sports this paints a nice visual image of when to attack or defend in these sports. Now let's take a look at how this applies in squash. 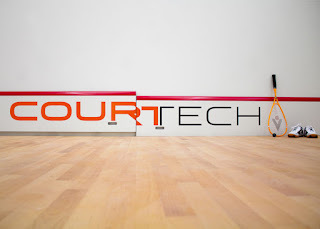 If you're good at math and angles or have played a lot of squash you'll understand that you have a better angle to attack when the ball is higher. This is the same as the other sports I discussed earlier. If the ball is below the height of the tin we cannot hit the ball downward or it will be an error. This is why it's so important to attack short when the ball is at the peak or the bounce. Of course this depends on your racquet skill and reach. If you try and attack a volley short well over your head you may struggle as this is a highly advanced skill. The higher you can attack the ball the shorter the ball can land on the floor. If you're cutting the ball it is also the easiest way to cut the ball and follow through to your target with an aggressive swing. When the ball is lower this becomes much more challenging. Another reason people struggle when he ball is below the tin ('net') is that they have difficulty getting low enough with the right form. Most people simply drop their racquet head to reach the ball instead of bending their knees and lowering their hips to get their hand and racquet lower. This takes a lot of lower body strength and balance to be able to do this. When the ball is very low the best approach is to hit the ball upwards and play a defensive attack. Of course if your opponent is completely out of position and you have superior dexterity in your hands you may choose otherwise. While if the ball is high and you are set and your opponent is behind you use the angle and height to hit down on the ball and attack short. If you want to improve your drops and nicks spend time solo hitting and learn the angles. Now let's talk about how changing the height of the tin impacts the game. The women are going to be testing out playing with a lower tin shortly; how will this influence their game? Who will this favour? And most importantly is it a good or bad thing for the women's game? Above we see a picture of a tin; half is at the standard 19" tin while the other is lowered to 17". I much prefer playing and watching attacking squash, so I like this move for the women. It clearly favours the Egyptians in my opinion, but many of the top women have very deceptive boasts. I think on standard panel courts the lower tin is a good move, but I'm not as certain about on the glass courts. The glass courts are slower already and plays bigger. I've seen a lot of top ranked women get picked part on the glass court simply because they lack exposure on the court. Now in major events when a lower ranked women plays a top 10 or 20 ranked player on the 4 wall glass show court the match will be over even faster. It's not that the lower ranked women can't adjust, they just don't receive enough hours on the court to adjust properly. So I feel that a 4 month trial is not long enough. The women should either make the move permanently or try it only on the standard courts which are normally quite a bit warmer and bouncier. But time will be the judge. I know the tournament organizers will be happy that they don't have to adjust the tin height between matches. That's it for today. I hope to be back with a new post next sometime. Next time you play think of the tin as a net and be aggressive when you have the ball high. Spike it into the nick! Good luck! If you want to check out some more videos from the 2015 Penang Junior Open I went to in June check out my Youtube channel @ cchsquashpro. I put up a couple of games from the boys and girls U19 semis.